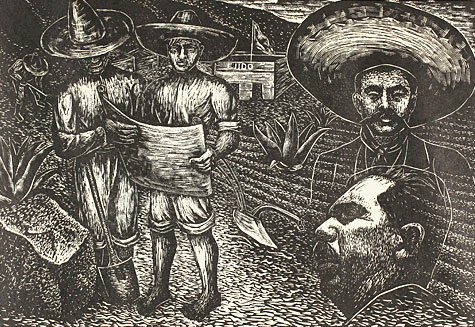 Luis Arenal, “Lázaro Cárdenas y La Reforman Agraria, 1934-1940 (Lázaro Cárdenas and Agarian Reform, 1934-1940),” 1947, linocut. Lawrence University’s Mudd Gallery hosts the exhibition “Selections from the Estampas de la Revolución Mexicana Portfolio” beginning Thursday, Feb. 11 and running through March 11. The exhibition, located on the third floor of the Seeley G. Mudd Library, is free and open to the public. The exhibition is part of a series of of community programs highlighting 500 years of diversity and achievement by Latino Americans through a partnership between Lawrence, the Appleton Public Library, Casa Hispana and the History Museum at the Castle. Featuring works from Lawrence’s permanent collection, the exhibition highlights the work of artists from the Taller de Gráfica Popular — The People’s Graphic Workshop — of Mexico City. The TGP is an artists’ print collective founded to advance revolutionary social causes. Beth Zinsli, curator and director of Lawrence’s Wriston Art Center Galleries, will deliver a gallery talk on the history and iconography of the Estampas portfolio to open the exhibition at 4 p.m. on Feb. 11. 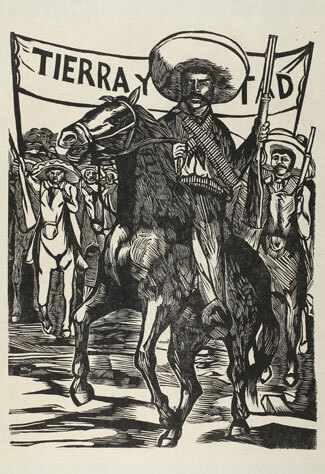 Francisco Mora, “Emiliano Zapata, lider de la revolución agraria (Emiliano Zapata, Leader of the Agarian Revolution),” 1947, linocut. While the exhibition features such historical figures as Porfirio Díaz, Francisco Madero, and Emiliano Zapata, it is counterbalanced by images that convey real concerns about the human condition and the denunciation of social and civil injustices. The community-wide “Latino Americans: 500 Years of History” program is supported by a pair of grants Lawrence received from the American Library Association and the Wisconsin Humanities Council with funds from the National Endowment for the Humanities.